Sydney Shop Girl: The Staycation Life #1: Cronulla and Bundeena. It's only taken me eight years as an adopted Sydneysider and one school age child with a passion for trains to finally get out of my comfort zone in the public transport network to explore places more than an hour away from home. It's been liberating being able to explore Sydney beyond my familiar reference points without having to contend with the traffic, the confusing names for motorways that GPS voices tend to give for most of the major arterial roads of the city and my general phobia of driving to unfamiliar places here. Today's staycation destination was Cronulla. An easy first place to visit on account of it just being several more stops along my usual train line beyond Town Hall that line in the sand station that defines where I usually go exploring in my down time. Cronulla has this addictive mix of retrotastic (see the Milk Bar at the station and the design of Cronulla station itself), beachtastic and wholefoodstastic (yep, just pulled that one right of the air as I typed) topped off with a whole lot of super friendly locals and (blissfully) toned down elements of the 'So Sydney' that you see 'back home' in the neighbourhoods of the inner city. Our first stop was for coffee at Press. Before we walked down past the train station to the ferry wharf. We set sail with a ferry full of like minded staycationers for Bundeena, a twenty minute ride away. It was just bliss disembarking and walking straight onto a beach this pristine and so quiet on such a beautiful bonus summer's day. Yes, I am making my peace with the weather because it's giving my opportunities to live like this on the school holidays. 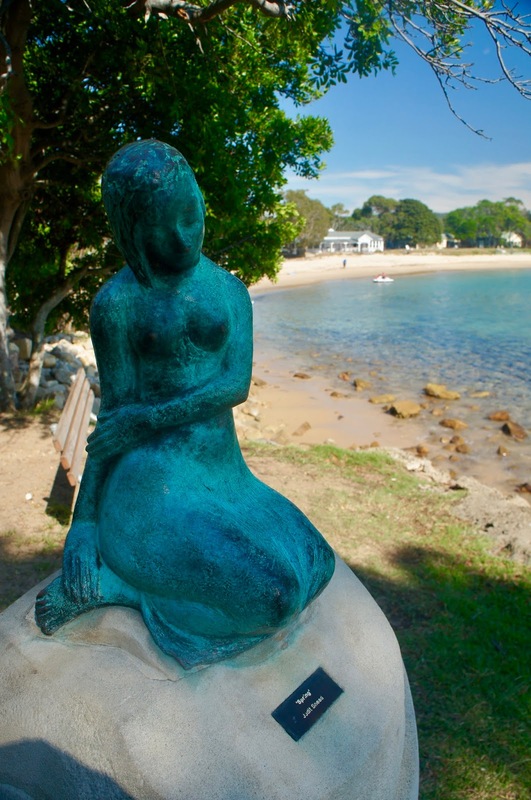 There's a strong artistic culture at Bundeena and once a month, many local artists open their studios to the public as part of an art trail through the village. Bundeena is also the gateway for places to day hike as well as an access point to the Royal National Park. We were content, however, to just sit back on the beach and search for shells and rocks to craft with at home. We also played 'hide and seek' which is as bizarre as it sounds on a beach as open as this. But hey, it kept us amused for longer than you would think. After returning to Cronulla, we took a closer look at the Cronulla Gallery Tunnel which links the main shopping precinct and train station to the ferry wharf. This plaque is on the train station end of the walk. While this is how you spot the tunnel coming from the wharf end. There was so much colour and energy in each work along the tunnel. It's such a beautiful idea for a public space and obviously much loved by everyone because the entire tunnel was immaculate. Not a single work was defaced and the tiles were graffiti free. It was thirsty and hungry work riding the ferry and frolicking on the beach so we hit the main street back at Cronulla for some mason jarred cold drinks and meals featuring fries. A steak burger for me and fish and chips for Master SSG. Is Cronulla or Bundeena your home? What or where do you love most about home? It has been nice having such warm weather recently, but having our aircon on yesterday was a bit much! I'm hoping it cools soon. The evenings are nice, still so warm during the day though.